I have been told about the Apache Felix Web Console a couple of times. During all of these occasions the guy telling me this had this peculiar look in his eyes. The look that makes you think: "Okay dude, I can see that you are serious. I have to check this out." The first time I went down there I tried to follow the described steps. The page talks about an "all-in-one" install but it was nowhere to be found. Then I tried to install the individual components from the Felix download site but for some reason I went from one un-resolved dependency to another. So, at that point, they lost me. Documentation... Once you are the expert you don't see where the newcomer gets lost. I am all to familiar with this. I believed we had created the easiest installation webpage for the Nebula community until I witnessed people trying to install. A few days ago I tried again, and basically with the same luck, so I started whining and left it again. However, it kept bugging me and I decided to finally research it until I was finished. And, you guessed it, it turned out the be quite easy. I am running a fresh copy of the Eclipse Classic installation. The first thing I did was to install the Felix webconsole. I downloaded the Web Console jar file from the Felix download site and dropped it into my Eclipse dropins directory. All of the above dependencies can be found in the Eclipse orbit repository. So I visited the Eclipse Orbit site and clicked on the download link to the right of the page. I always choose one of the latest stable builds and this is the link. That page contains the link to the P2 repository. 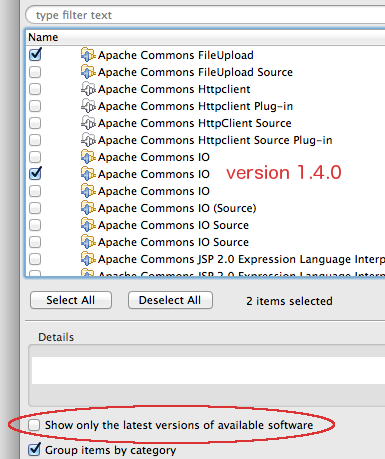 Web Console needs an older version of commons io, version 1.4.0. 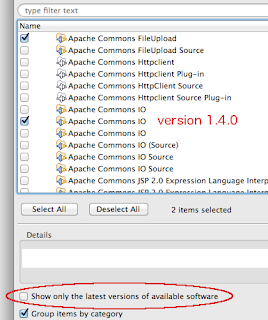 Un-tick the "show only the latest.." checkbox in the dialog as indicated in the picture and select the three features from the list. The Web Console needs a web server to serve its pages. Fortunately, Eclipse Classic comes with a build-in web server called jetty. On the console prompt type "ss jetty"
I have number 93 so I type "start 93"
We can do this by adding this property to the eclipse.ini file and restarting. Aiiii. It is not working! Why? We also need to start the webconsole bundle. And now it works. Pretty cool!